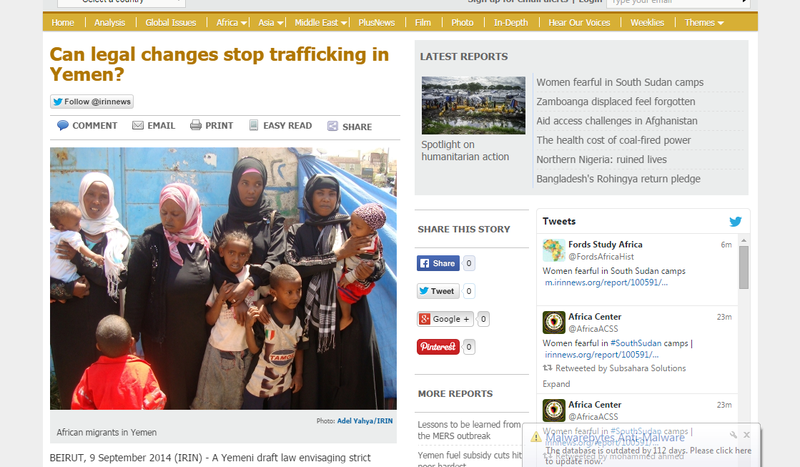 Can legal changes stop trafficking in Yemen? BEIRUT, 9 September 2014 (IRIN) – A Yemeni draft law envisaging strict penalties for those involved in trafficking migrants, including kidnapping them and demanding ransom, may finally bring an end to decades of exploitation. To give the process a push, the International Labour Organization (ILO) co-hosted a three-day workshop from 6-8 September with Yemen’s Ministry of Human Rights in Lebanon’s capital Beirut, bringing together government entities, international agencies, and non-governmental groups to develop Yemen’s anti-trafficking roadmap.